Zen Parenting: This is Your Brain. This is Your Brain on Circumcision. Any Questions? This is Your Brain. This is Your Brain on Circumcision. Any Questions? "It's best to circumcise boys as newborns, so they won't remember it." Everything, ev. er. y. thing. we experience is stored in our brains. Did you miss that? EVERYTHING. Specifically, the amygdala, a tiny little part in the medial temporal lobe of the brain, performs a primary role in memory and emotional response and stores all, ALL, painful and traumatic experiences. "Because the amygdala learns and stores information about emotional events, it is said to participate in emotional memory. Emotional memory is viewed as an implicit or unconscious form of memory and contrasts with explicit or declarative memory mediated by the hippocampus" (Scholarpedia). Circumcision is inarguably one of those painful and traumatic experiences that is indelibly imprinted upon one's emotional memory. "In humans, it is the most sexually-dimorphic brain structure, and shrinks by more than 30% in males upon castration. Conditions such as anxiety, autism, depression, post-traumatic stress disorder, and phobias are suspected of being linked to abnormal functioning of the amygdala, owing to damage, developmental problems, or neurotransmitter imbalance" (Science Daily). 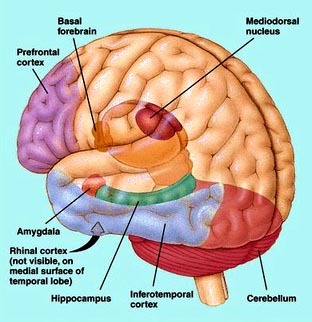 The amydala has connections to aggression, sexual orientation, fear and fear response, social response and interactions, alcoholism, anxiety, stress, sexual arousal, and depression. Stimulate the amygdala improperly, through traumatic circumcision, for instance, and one is at risk for problems with any or all of these. The amygdala is partially responsible for innate behaviors and resultant physiology within us. The ol' "Circumcision doesn't affect anyone. They turn out just fine" argument just doesn't hold water. Simply put, circumcision affects the very base of who he is and, because it is done so early on in his life, there's no other version of him with which to compare or contrast. The way he was born is irrevocably altered by that painful and traumatic experience. There' no getting around it. This is science. This is your brain. And this is your brain on circumcision. Any questions? Exactly! Please look into the work of Dr. Gabor Mate on addiction and brain development. He talks about trauma and how it changes the brain and he discusses the neural pathways in the brain and the endorphines and dopamine connections. It's important stuff. We are not raising our children in a biologically appropriate manner and it effects them forever! American birth practices are traumatic, babies are separated from mothers, circumcision is a huge trauma, too few initiate breastfeeding and babies are almost never breastfed for a biologically appropriately length of time. Separating babies for sleep and crying it out and scheduled feedings are traumatic. I could go on and on....our society is deeply damaged by the way we raise infants. What if your child slept through the whole procedure? That's shock, not sleep as we generally think of it. Shock in babies looks different than it does in adults. If you're a woman, which I'll assume you are, since the majority of my readers are, I'll ask you this: would you be able to sleep through the cutting off of your clitoral hood? I so do not think it was shock since he was sleeping when we took him in and never woke up until we were driving on our way back home. I understand, but like I said, shock presents itself much differently in babies than in adults. Unless you're familiar with what shock looks like in babes, it's hard to judge what it is and is not. May I ask again, would you be able to sleep through the cutting off of your clitoral hood? Not to sure but maybe if I was 4 days old with a full belly that my mom had just fed and was sound asleep then you know what maybe I could sleep through it. There were a lot of babies that slept through the procedure, we had a very experienced and gentle doctor do the procedure and he was great! Will you not entertain the possibility of shock at all? I understand that doing so would bring about unbearable heartache, but the truth will set you free. There can never be anything gentle about tearing and cutting the most sensitive tissue on the baby's body. No, I will not entertain the possibility that it was shock at all. If he was awake when we took him in and then when the procedure started and he fell asleep then maybe I would entertain the possibility. Will you entertain the possibility that this statement "Circumcision is inarguably one of those painful and traumatic experiences that is indelibly imprinted upon one's emotional memory." is not true and then the truth will set you and all your readers who believe this free? I am always open to new information. When I am presented with facts that prove that my statement is untrue, I will certainly be forced to reevaluate. You're deluding yourself with an illogical fallacy if you think that him being asleep before and after the amputation somehow proves he wasn't in shock. A sleeping newborn most certainly CAN be strapped down and cut before they wake up, go into shock, and remain 'sleeping' for much longer than expected. In fact, non-responsiveness is a classic symptom of shock in an infant, and it happens OFTEN after circumcisions. http://www.drmomma.org/2011/03/he-didnt-cry-babies-in-shock.html - a good place to start learning the truth. This is scientific proof that circumcision causes lasting damage. I'm afraid one baby sleeping, unmonitored and outside of a regulated study, can not stand as sufficient opposing evidence to disprove the findings. The more I read over the five years my son has been intact, the happier I am with our decision to not circumcise. No mother would consent to this. Women that do arent mothers. Just a womb on legs.